Their first CD “… à deux” is the result of the special collaboration between Christian Laborde and Benoît Albert. The title of each track is like a clue, a trail to follow as in a childhood game, leading the listener to discover a new musical world. 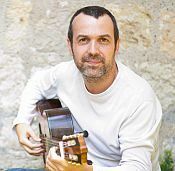 As a solo guitarist, chamber musician and composer, French guitarist Benoît Albert is a unique and versatile presence in the world of classical guitar. Benoît Albert grew up in Charente, in a Southwest region of France. As a very young man he was inspired by pop, progressive rock and classical music. Later, at the age of 14, he decided to study classical guitar. He acquired his formal education at the Conservatoire de Bordeaux and the Conservatoire National Supérieur de Musique et de Danse de Paris, where he graduated with top honors. His teachers were Olivier Chassain and Carel Harms for the guitar, Pierre-Laurent Aimard, Christophe Coin, Christian Ivaldi, Jean-Guilhem Queyras and Laszlo Hadady for the chamber music, Frederic Durieux for musical analysis and Patrice De Faccio for the musical style studies and writing. As a performer, Albert has toured Europe, Venezuela, the US, and Malaysia. He has co-created productions involving modern dance (Laurène Albert, PM4 project), paintings (Paul Storey and Pierre Cambon), and chamber music (Les Frères Méduses, La Compagnie des Arts and Suonatori). His solo concerts are crafted around historical guitars illustrating musical periods and styles : his « Guitar Triptych » project features a Stauffer romantic guitar from 1827, an american parlor Martin guitar from 1905 and a modern classical guitar built by Erik-Pierre Hofmann in 2013. As a composer, Albert describes his musical language as modal with a broad rhythmical spectrum reflecting popular music influences from Eastern Europe and North/South America as well as French impressionistic music and electronic music. He began writing music for his ensemble « La Compagnie des Arts » in 2003 and continues to do so even today. His works include composition for solo instruments like english horn, violin, bass clarinet or guitar and for various chamber music ensembles with guitar. He also likes to create electronic music manipulating sound samples. Christian Laborde created a school of Fingerpicking in 1979, regulates many internship and did not hesitate to lead master classes during his tours. It occurs on many national and international stages since 1992 and accompanied his wife, Delilah singer. They recorded an album together A "this hour". He holds the section Hammer Picker in the monthly Guitarist Magazine from 1997 to 2001 and is involved in the section Notebook - Manual of the fortnightly magazine Acoustic Guitarist. He participated as second guitar, accompanied by Jean Felix Lalanne, the recording of the album of Marcel Dadi Dadi two guitars, it is also present with Jean Felix Lalanne and Eric Kristy in the album Guitar Légend Vol. 1. Since 2003 he plays in duo with classical guitarist Albert Benedict. They jointly wrote an original repertoire pieces for 2 guitars.